The Miraculous Medal, also known as the Medal of the Immaculate Conception, is a medal created by Saint Catherine Labouré in response to a request from the Blessed Virgin Mary. 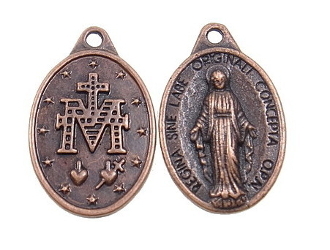 Many Catholics around the world (and some non-Catholics) wear the Miraculous Medal, which they believe will bring them special graces through the intercession of Mary if worn with faith and devotion. It is often worn together with the Brown Scapular. Saint Catherine stated that on the night of July 18, 1830 she awoke upon hearing a voice of a child calling her to the sisters' chapel (located in the Rue du Bac, Paris), where she heard the Blessed Virgin Mary say to her, "God wishes to charge you with a mission. You will be contradicted, but do not fear; you will have the grace to do what is necessary. Tell your spiritual director all that passes within you. Times are evil in France and in the world."